While doing a double pre-release for Magic - a paper card game - I got hungry and didn't really have a time slot for an actual meal so I popped to the local Oriental Grocers. SoEasy has a wide selection of drinks for me to keep me going (proper teas, Pocari Sweat, Aloe Vera drinks) but less that I could eat on the go. I looked at all the hard noodles that I could buy to take home, but settled on the things that could just be eaten straight out of the bag. 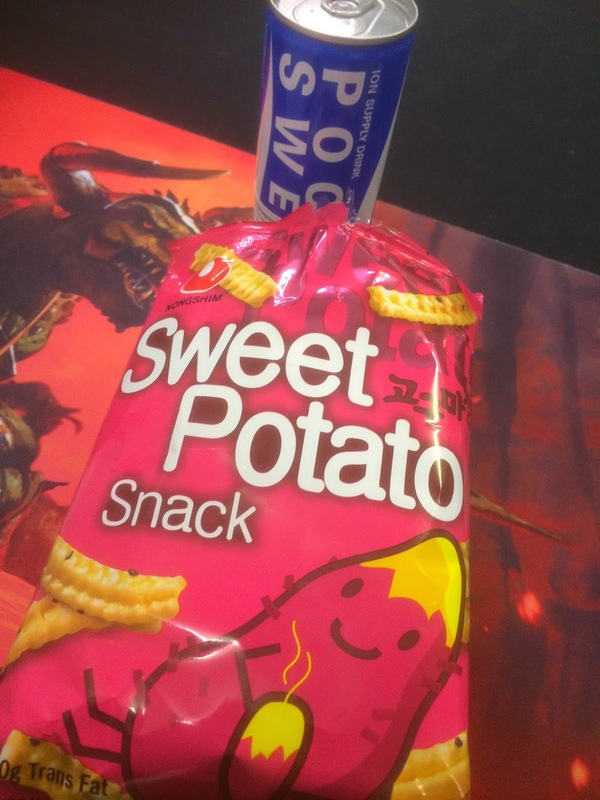 I settled on this Sweet Potato snack. The guy on the bag seemed happy enough and they looked like the euro-crisps that I ate and liked in Norway. These aren't actually as straight forwards as I expected - they seem to be sugar coated crisps snacks. They have sunflower seeds sesame seeds - see comments, and the potato itself, a few other mystery flavours and the sugar coating. I was worried that these would be a little crazy and a one off purchase. Actually the combo really works and I enjoyed them so much I only shared them with a few people. Sometimes import snacks are a bit expensive - they have to be especially shipped over - but at 99p per bag they are something I could easily justify buying again. I'm still not sure who these were actually made by but I will try to find that out and then trawl the other flavours in the range. I have to admit - it's the main reason I chose this brand! This is a South Korean brand and a common korean snack as sweet potatoes are a popular street food. The little black seeds are sesame seeds though, not sunflower seeds. Like most korean snacks, they have a sugary glaze. For a savory snack try the shrimp sticks/chips.